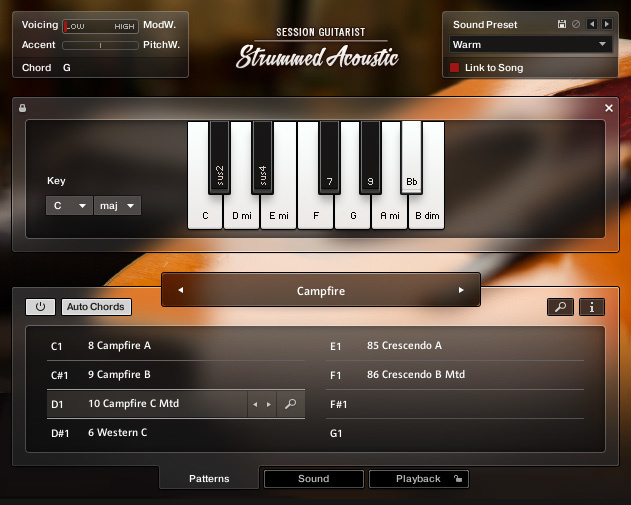 Strummed Acoustic’s Pattern page with the keyswitch options mapped onto the Kontakt virtual keyboard. Whatever your playing skills or quality of instrument, capturing a pristine acoustic guitar recording can be a challenge in a home or project studio environment in the absence of a suitable acoustic space and some equally suitable microphones. If you find nailing the sound problematic, as with other instrument types, you can turn to virtual acoustic guitars. Top of this particular tree are products such as RealGuitar and Acou6tics, both of which have been reviewed in SOS. These offer some seriously good ‘playable’ virtual instruments, which allow you to construct performances that would slot right into almost any polished chart production. However, while something like Acou6tics is both powerful and sophisticated, it does come with a sizable price tag and a suitable learning curve. If we slip back in time about 10 years or more, a precursor to Acou6tics was Steinberg’s Virtual Guitarist. While it would now sound a little dated, the underlying concept was a good one: the instrument provided a range of preset performance patterns (strummed and picked) triggered through keyswitches but allowing those performances to be played at any tempo and using any chord. It was very easy to use and, within the limits of the sampling technology of the day, sounded respectable. If you take the modern sonic brilliance of something like Acou6tics and combine it with the simplicity of use provided by Virtual Guitarist, then you get very close to what Native Instruments’ Session Guitarist Strummed Acoustic is all about. And as it comes with a rather nifty Kontakt front-end and a price accessible to the home and project studio owner, it sounds like a very attractive proposition indeed. Let’s find out. What’s In The Guitar Case? 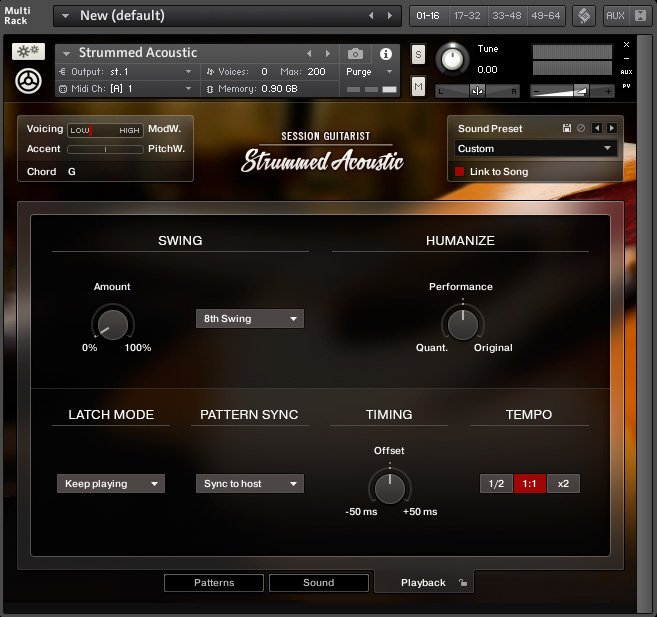 Strummed Acoustic requires either the free Kontakt 5 Player or the full version of Kontakt 5. The instrument is available as a 9GB download, but, once downloaded, installation and authorisation are straightforward using NI’s usual Service Centre tool. 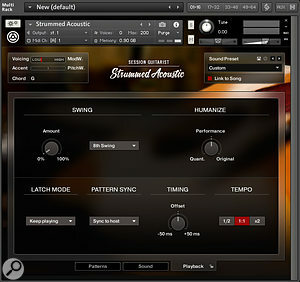 Within Kontakt, Strummed Acoustic consists of a single .NKI instrument patch. When loaded, by default, the dedicated front-end shows the Patterns page and from here you can select a set of strummed performance patterns. These are grouped into ‘song’ presets, but you can also select any of the 100-plus individual strumming patterns and load them into one of the eight slots that make up a preset. As with any multi-articulation instrument, each of these strumming patterns is triggered via a keyswitch and, if you have the Kontakt virtual keyboard display enabled, these are indicated as a group of eight keys starting at C1. An additional five keyswitches (G#1 to C2, coloured yellow) provide ‘endings’ while three further keyswitches (C#2 to D#2, green) trigger what NI term ‘pickups’ (a body thump and muted finger slides up/down). The instrument can also add variable amounts of fret noise for additional realism. Within the blue range of keys you can play chords and, based upon which keyswitched pattern is selected, you will then hear that chord played with the selected strumming pattern. You can, therefore, simply construct a full performance by changing chords, varying the pattern played and then adding suitable endings or pickups as required. For the strummed patterns, there is a latch mode available and Strummed Acoustic does, of course, keep everything locked and sync’ed to your project’s tempo when you change chords, trigger endings or simply stop playing when not in latch mode. Note that both the endings and pickups respond to MIDI velocity, but the main patterns do not. The latter already have their own performance dynamics but, for further control, you can add your own emphasis or accents using the pitch-bend wheel. The preset patterns are quite varied. Most are in 4/4 time but there is a small selection in 3/4 and triplet feel. However, you can add some further time-signature variations by pressing the ‘i’ icon. This opens the additional Pattern/Mapping dialogue and you can customise the step length of the currently selected pattern and adjust its start point. 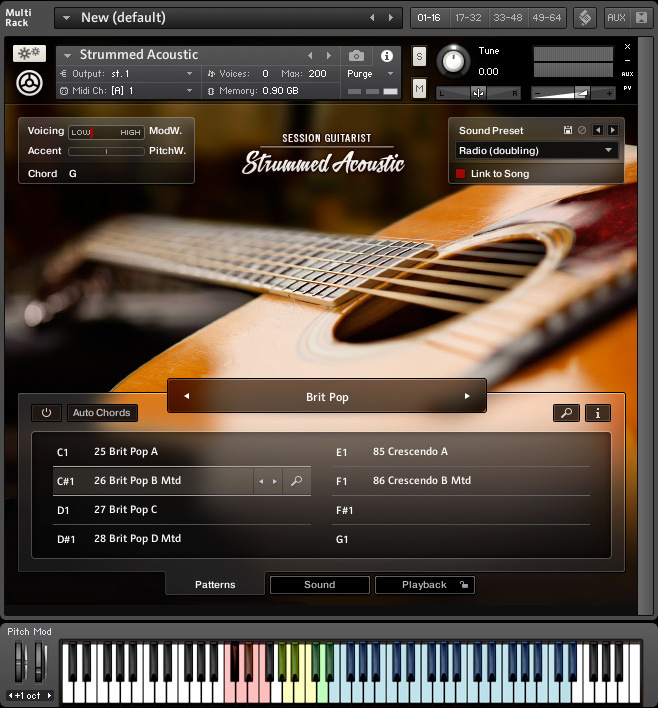 The Sound page allows you to adjust the character of the acoustic guitar’s sound in various ways.Oh, and if your keyboard skills are less that stellar, you can also toggle on the Auto Chord options. This gives you the ability to change chords, and add extensions to chords, within a chosen key without actually having to finger the full chords themselves — very neat. If you like your guitar parts in stereo or double-tracked, Strummed Acoustic has that covered via the Sound page. Here, as well as some basic effects, you can adjust the voicing of the guitar to simulate the player moving between low and high positions on the neck. This balance can also be adjusted in real time via the mod wheel. However, there are also options to simulate either stereo or double-tracked guitars. These really are very effective and, if you add in a suitable dollop of reverb, you can generate a very pleasing spread of acoustic guitar across your stereo image. The effects — EQ, compression and reverb — don’t offer you much by way of control, but the presets provide some sensible options and allow you to easily tailor the sound to sit in your overall mix. There is also the option to adjust the amount of fret noise that gets added to some chord changes. The Playback page gives you additional control over the performance options of the instrument.The Playback page allows you to add a variable amount of swing (eighth-note or 16th-note varieties) to the performance patterns and also to ‘humanise’ the performance by adjusting the level of quantise applied. It’s here that you also set the latch mode and sync mode while you can also ‘push’ or ‘pull’ the timing slightly and get patterns to play at half or double time. Many of the patterns seem to survive quite well over a range of different playback tempos, with 60bpm being about at low as you can go. In use, Strummed Acoustic has plenty of positives. The original recordings were made using a vintage Martin D35 and it’s clear from the quality of the sound that the recording process, performances and subsequent sample manipulation have been done to a high standard. As a means of creating a solid, strummed acoustic guitar part, this is unbelievably easy and, while you can do a little extra work via the pitch and mod wheels to add your own dynamics and shifts in the voicings, even this is embarrassingly simple given just how polished and ‘produced’ the final end result can be. Strummed Acoustic might not work in all musical contexts, particularly if your production needs to be carried by a characterful, dynamic (living, breathing, human) acoustic guitar part, but for consistent, polished strumming, it is right on the money. The Auto Chord option makes it even easier to play Strummed Acoustic.On a practical level, you do have to get used to triggering your chords just a fraction ahead of the actual change required in order to hit the beat, but this is something mastered within minutes of using the instrument. Otherwise, the interface is beautifully laid out and a pleasure to use. If you really wanted to be picky (OK, greedy given the modest asking price), then you do only get one six-string acoustic — no 12-string, no nylon and no altered tunings. Equally, you have to work within the preset strumming patterns and, while there are plenty of them, they are so good that, frankly, you do just want more (or even the ability to create your own?). Given the full title of the product — Session Guitarist Strummed Acoustic — I’m also wondering whether there might be other ‘Session Guitarists’ in the pipeline. Picked Acoustic, Strummed 12-String or Strummed Electric perhaps? Yes, by the time you had purchased all of these then the total cost would soon creep up, but the concept and execution of Strummed Acoustic is very clever indeed and it is difficult to imagine that it could not be capitalised upon with other, themed, products. The bottom line here, however, is that within its well-defined scope — solid, strummed acoustic guitar parts — Strummed Acoustic does an excellent job with a minimum of fuss. The obvious comparison is with Acou6tics. It’s not as sophisticated or flexible as that alternative, with its range of acoustic guitars and more powerful performance options but, equally, Strummed Acoustic is less expensive and easier to get to grips with... and still manages to do a great job. 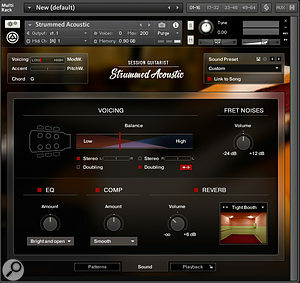 Whether you play the guitar or not, NI’s new virtual instrument makes it ridiculously easy to achieve great results and, if you just need a polished strummed acoustic guitar part as part of your overall production, the question for many home/project studio owners — or media composers up against a deadline — is whether you could really do better with a real guitar and a mic? Strummed Acoustic might not have me selling my Taylor just yet, but it might mean I have to dust it more often. For what it does — strummed six-string acoustic parts — it sounds great. Slick user interface and performance engine. Good selection of strummed patterns, but you are, ultimately, limited to these. If I’m being greedy (and I am), no picked performances. Strummed Acoustic is a tightly targeted product. It perhaps will not deal with all your acoustic guitar needs, but for polished, consistent, strummed acoustic parts with an absolute minimum of fuss, this is great value for money. Apple iMac with 3.5GHz quad-core i7 CPU, 32GB RAM running OS X 10.9.5.